The Samsung Galaxy Tab S4 is listed as having the model name ‘samsung SM-T835’ and scored 1895 on the single core test and 6362 on the multi core test. Samsung might be close to launching a successor to its Galaxy Tab S3 tablet. 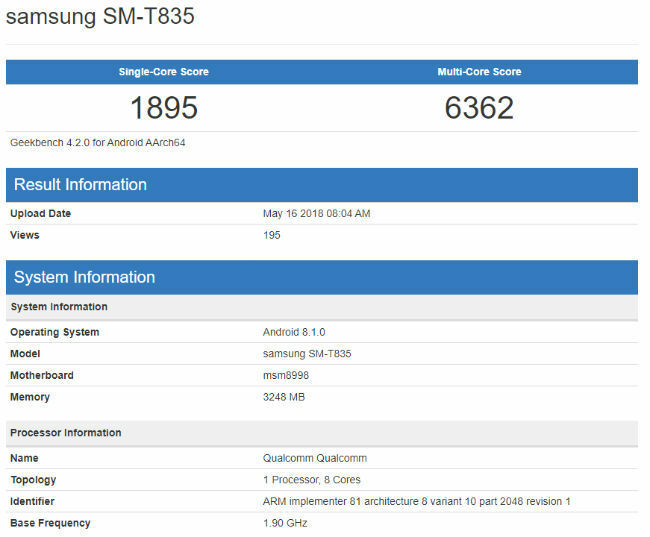 A Samsung device with the model name ‘samsung SM-T835’ was spotted on benchmarking website, Geekbench, and speculation suggests that this could be the Samsung Galaxy Tab S4. The tablet is tipped to be powered by a Qualcomm’s Snapdragon 835 SoC with 4GB of RAM. The device is also listed as running on Android Oreo v8.1. The device managed to score 1895 on the single core test and 6362 on the multi core test. The Samsung Galaxy Tab S4 was spotted on GFXBench back in February this year, and the specs match up to the current leak. The GFXBench listed state that the phone would offer a 10.5-inch display size with a resolution of 2160 x 1600 pixels. The device was also listed as having a 12MP camera at the back, while at the front the tablet may feature an 8MP camera. It should be noted that model name in most the listings were the same. Samsung was initially expected to unveil the tablet during MWC 2018, but that did not happen. 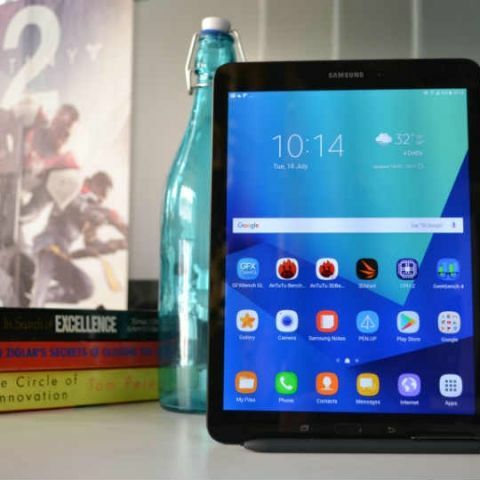 To recall, Samsung launched the Galaxy Tab S3 tablet at MWC 2017, followed by an Indian launch in June of the same year. The tablet was launched at a price of Rs 47,990 and features a 9.7-inch sAMOLED display with a resolution of 2048 x 1536 pixel. The Samsung Galaxy Tab S3 is powered by a Snapdragon 820 SoC with 4GB of RAM and 32GB of onboard storage. At the back of the device is a 13MP rear camera, while at the front is a 5MP camera. The tablet also came bundled with the company’s S-Pen stylus. You can read our review of the Samsung Galaxy Tab S3 here.